Whether you call them intermediate controls, flow controls, pressure/flow controls, demand expanders, or any other name, the proper application of them has always been a bit confusing to users. Some people will say that they should be used in nearly every application and some say there is no need for them in any application. The truth, as usual, is somewhere in the middle. 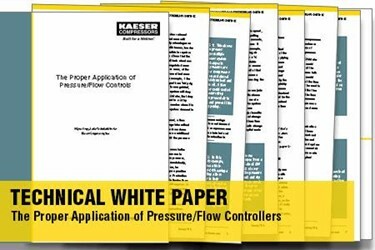 Although this white paper refers to flow controllers, it applies to most all pressure/flow controls. We will use the generic term “flow controller” to refer to this class of control. A flow controller is in essence a precise and rapidly responding pressure regulator that reacts very quickly to changes in downstream demand, releasing large volumes of air from storage to maintain system pressure. It is not uncommon for them to be able to maintain (with adequate storage upstream) system pressures within plus or minus 1 psig even with large swings in system demand. With such tight control, the downstream pressure setting can be reduced to the minimum required for the end uses of the compressed air.